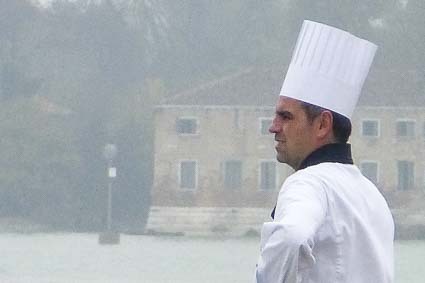 ABOVE: Executive Chef Daniel Triku takes a break on deck as River Countess approaches its Venice mooring. INSET BELOW: Mooring at Riva dei Sette Martiri, cruise manager Tony Campailla, a surprise birthday cake, a receptionist, and a sailor on the gangway. A first and second captain. A typical river vessel has two captains or river pilots who work alternating shifts. During our voyage, River Countess had three captains: First Captain Richard Martin, Second Captain Mario Polidoro, and Captain-in-training Thijs Van der Lee, who will command the ship in 2015. A chief engineer and engine-room staff. These crew members work belowdecks, tending the ship's diesel engines and other mechanical systems. A hotel manager. Mario Mirao, the dapper and personable hotel manager during our cruise, was in charge of the ship's hospitality operations. A cruise manager. On a river ship, the cruise manager or cruise director is responsible for shore excursions, transfers, and onboard passenger activities. Tony Campailla, the cruise manager during our voyage, brought a transatlantic sensibility and a firm grasp of American vernacular to the job: He lived in Los Angeles for eight years, running tours for Europeans on America's West Coast, before moving back to Italy and joining Uniworld. Kitchen, dining-room, and bar staff, including Executive Chef Daniel Triku, a restaurant manager, cooks, bartenders, and a team of cheerful, hard-working waiters (mostly from Eastern Europe). Receptionists in the ship's lobby, who serve passengers and maintain security 24 hours a day. Housekeeping staff--among them, Csaba, our suite attendant, who kept our room spotless and well-supplied with fruit, ice, drinks, and toiletries. Sailors who maintain the ship, operate winches for the mooring lines, deploy the gangway, and perform other maritime duties. Uniworld includes all tips for onboard and onshore services (including shore excursions) in its European cruise fares, so tipping is neither encouraged nor expected. Next page: Is River Countess right for you?